Lysine is an essential amino acid necessary for growth and to help maintain nitrogen balance in the body. It may help promote proper nitrogen balance in the body and prevent glycation, the combining of a sugar and protein molecule accelerated by elevated levels of sugar in the blood. Most people consume adequate amounts of lysine. However, vegans whose diets contain large amounts of grains and only minimal amounts of beans could become lysine deficient. Athletes involved in frequent vigorous exercise have an increased need for essential amino acids, although most diets meet these increased needs. The essential amino acid requirements of burn patients may exceed the amount of lysine in the diet. 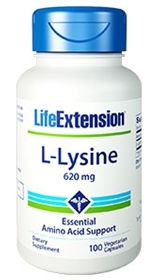 Lysine works with other essential amino acids to maintain growth, lean body mass and the body’s store of nitrogen. In addition, dietary supplementation with the essential amino acid L-lysine has been shown to reduce anxiety in humans with low dietary intake of L-lysine. L-lysine, together with arginine, has been documented to normalize hormonal stress responses in humans with high trait anxiety.